If you like Minecraft, then you’ll love today’s Free App of the Day. 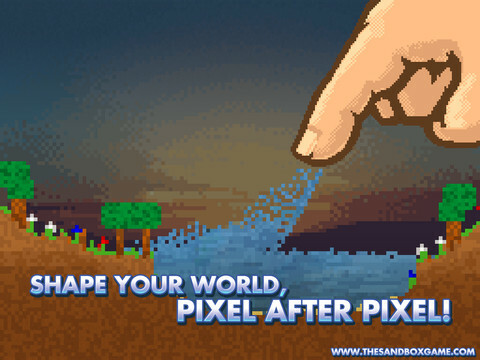 The Sandbox is a pixelated treasure where you’re in control. Discover the User-Created campaign, a total of 10 levels free campaign made from the top creations by the community! Can you solve them all? Imagine creating your own universe (complete with amazing Pixel Art), composing your own music, and much, much more. The universe is yours to create or destroy, and the only limit is your imagination! Start from scratch with basic building blocks like stone, water and soil. Once you discover mud and sand, you’re on your way! Grow plants, raise mountains, generate life and gain access to advanced tools for crafting more and more complex elements. Before long, you’ll be able to access non-organic elements like metal and light bulbs, allowing you to populate your universe with creations both natural and technological. ● Millions of possibilities. Infinite landscape designs. Countless different chemical reactions. Nothing is beyond your reach! ● Six exciting campaigns — a whopping 96 game levels in all! ● Add an intelligent life-form to your worlds : Humans! ● Change their behaviour using one of the 4 Job Magic Powders and turn them into a Miner, Builder, Hunter or Woodcutter. Dozens more behaviours will be added over time! ● Recreate the Jurassic Period with giant dinosaurs and volcanoes! Protect your dinosaurs from extinction or recreate the BIG BANG and make them disappear! ● Utilize our new Blueprints and add awesome real-life wonders to your worlds: the Eiffel Tower, Chichen Itza, the Pyramids, the Leaning Tower of Pisa, the Statue of Liberty — even a Pagoda! ● TNT and C4 are now available! Wreak havoc with powerful explosions! ● Deep-sea fish and fireflies come to life before your very eyes! ● Create amazing chain reactions with several sensor types, including liquid, light and temperature! ● New ways to acquire FREE Mana, such as daily challenges, watching videos clips or many more! ● 55 new missions through five exciting campaigns — a whopping 85 game levels in all! An entire universe in the palm of your hand!